Israeli forces continued with systematic crimes, in the occupied Palestinian territory (oPt), for the week of 16 – 29 August, 2018. 239 civilians, including 52 children, 6 women, and 5 paramedics, were wounded; 10 of those wounded sustained serious injuries. 14 Palestinian civilians, including 4 children, were wounded and in the West Bank in addition to a foreign activist, who was wounded twice. Israeli forces continued to use lethal force against Palestinian civilians, who participated in peaceful demonstrations organized within the activities of the “Great March of Return and Breaking the Siege” in the Gaza Strip, which witnessed peaceful demonstrations along the eastern and northern Gaza Strip border area since 30 March 2018. During the reporting period in the Gaza Strip, the Israeli forces killed 2 Palestinian civilians. Moreover, the Israeli forces wounded 241 others, including 52 children, 6 women, a fisherman and 6 paramedics. Ten of those wounded sustained serious wounds. In the West Bank, the Israeli forces wounded 14 Palestinian civilians, including 4 children. Moreover, a Norwegian female activist was wounded twice. In the Gaza Strip, on 17 July 2018, Israeli forces killed Sa’adi Abu Mo’amer (27), in the east of al-Shawkah village, east of Rafah, and Karim Abu Fatayer (28), in the vicinity of Um Hassiniyah Hill, east of al-Buraij refugee camp in the central Gaza Strip, during their participation in the Great March of Return and Breaking Siege activities. Both Sa’adi and Karim were hit with a live bullet to the head. 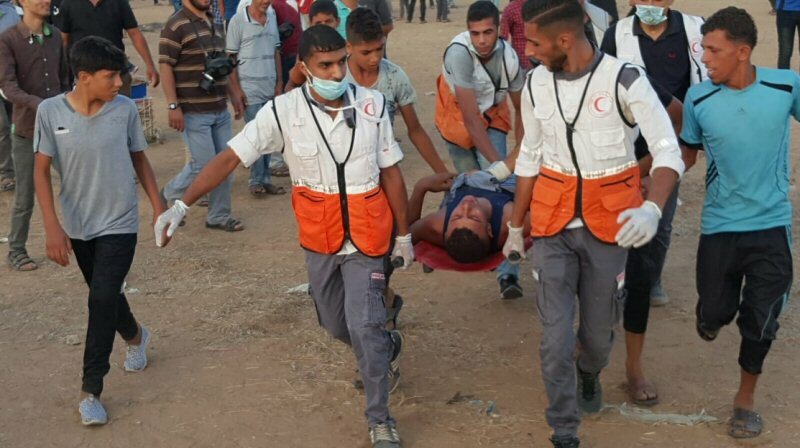 During the reporting period, while using the excessive force against the peaceful protesters along the Gaza Strip borders, the Israeli forces wounded 239 Palestinian civilians, including 52 children, 6 women and 5 paramedics. Ten of those wounded sustained serious wounds. As part of targeting Palestinian fishermen in the Gaza Sea, the Israeli forces continued to escalate their attacks against the Palestinian fishermen, pointing out to the ongoing Israeli policy of targeting their livelihoods. During the reporting period, PCHR documented 4 shooting incidents against the fishermen, 2 of which were in the northern Gaza Strip, one in the central Gaza Strip and one in the southern Gaza Strip. As a result of these attacks, 6 fishermen were arrested, 2 of them sustained wounds and 3 fishing boats were confiscated. In the West Bank, during the reporting period, the Israeli forces wounded 14 Palestinian civilians, including 4 children. In addition a Norwegian female activist was wounded twice during her participation in the weekly demonstration, which is organized in Kufor Qadoum village, northeast of Qalqiliyah. During the reporting period, Israeli forces conducted at least 98 military incursions into Palestinian communities in the West Bank and 10 similar ones into Jerusalem and its suburbs. During those incursions, Israeli forces arrested at least 68 Palestinians, including 13 children and a journalist, in the West Bank. Meanwhile, 24 other civilians, including a child and a woman, were arrested in Jerusalem and its suburbs. In the Gaza Strip, on 21 August 2018, the Israeli forces moved about 70 meters into the east of ‘Abasan al-Kabirah, east of Khan Younis in the southern Gaza Strip. They levelled lands adjacent to the fence and repaired the security fence before redeploying along the border fence between the Gaza Strip and Israel. As part of the collective punishment policy applied by the Israeli forces against the Palestinian families of those accused of carrying out attacks against the Israeli forces and/or settlers, Israeli forces demolished a house belonging to the family of Mohammed Dar Yusuf (17) in Kuber village, north of Ramallah. The 100-square-meter house was comprised of one floor and sheltered 3 members, including a child. It should be noted that the Israeli forces killed the abovementioned child on 26 July 2018, when he carried out a stab attack in “Adam” settlement established on lands of Jaba’a village, northeast of occupied Jerusalem. The attack resulted in the killing of an Israeli settler and the injury of 2 others. The Israeli forces are still detaining the child’s corpse. As part of demolishing houses and civilian facilities, on 29 August 2018, the Israeli municipality vehicles demolished a commercial shop in ‘Ein al-Lawz neighbourhood in Silwan village, south of the Old city in the occupied East Jerusalem. Samarin Family said to PCHR’s fieldworker that the Israeli police along with special forces raided and searched a printing house belonging to ‘Ezz Eden Samarin in ‘Ein al-Lawz neighbourhood and demolished it claiming that it was built without a license. The family added that the printing house was built on an area of 70 square meters and they rented it from Omer ‘Awni Siyam, who is its owner. The family also said that the municipality crews came 2 months later and took photos of the printing house and then handed the family a demolition notice. The family confirmed that their lawyer stopped the demolition decision, but the municipality came and demolished the printing house. As part of its Seizing Palestinian civilians property in favor of settlement associations, a group of settlers, under the Israeli forces protection, moved into al-Shiekh Jarrah neighborhood, north of occupied East Jerusalem and seized a land belonging to Abdel Raziq al-Shiekh. Hashem Bader, Member of al-Shiekh Jarrah Families Committee, said that Israeli forces accompanied with representatives of the so-called Absentee Property Custodian Department moved into al-Shiekh Jarrah neighborhood and seized a 50-square-meter land belonging to Abdel Raziq al-Shiekh, adjacent to his house and next to “Kabanyet Oum Haroun” area. He added that Israeli forces imposed a security cordon on the area and prevented Palestinian civilians from entering it. The Israeli forces then secured Israeli settlers and the bulldozer that levelled the land and uprooted the trees. It should be noted that the plot of land was seized without any judicial procedure, in which the “General Custodian “claims his ownership of the land. Bader added that ‘Abdel Raziq al-Shiekh owned the land for more than 50 years. On 20 August 2018, Israeli forces levelled a residential tent belonging to Yusuf Ayoub Abu ‘Aram in Khirbat Kawakis, near the Street (317), southeast area of Yatta, south of Hebron, under the pretext of non-licensing. On 29 August 2018, Israeli forces demolished 4 barracks built of of tin plates and a concrete floor in Barta’a al-Sharqyia village in the annexation wall, southwest of Jenin. One of those barracks was used as a poultry slaughterhouse and the 3 other barracks were used for breeding livestock and poultry. Moreover, 15 electricity poles feeding the area mentioned above were demolished. In the reporting period, PCHR’s fieldworker in the West Bank documented 12 attacks by Israeli settlers, most of them were in the northern West Bank. As a result of these attacks, 3 civilians, including 2 children, were hit with stones and scattered glass. Moreover, 35 vehicles sustained material damage and 535 olive trees were uprooted, cut and broken. As part of the collective punishment policy adopted by the Israeli forces against the Palestinian civilians accused of carrying out attacks against Israeli soldiers or/and settlers, on Tuesday, 28 August 2018, the Israeli forces demolished a house belonging to Mohamed Dar Yousef (17) in Kobar village, north of Ramallah. According to PCHR’s investigations, at approximately 03:30 on Tuesday, Israeli forces backed by dozens of military vehicles and accompanied with a bulldozer moved into Kobar village, north of Ramallah. They surrounded a house belonging to the family of Mohamed Dar Yousef (17) and then demolished it completely. The house was built on an area of 100 square meters, sheltering 3 members, including a child. Meanwhile, the Israeli forces fired sound bombs and tear gas canisters between the residential houses, but no injuries among civilians were reported. At approximately 05:00, the Israeli forces withdrew from the village, and no more incidents were reported. It should be noted that the Israeli forces killed the abovementioned child on 26 July 2018, when he carried out a stab attack in “Adam” settlement established on lands of Jaba’a village, northeast of occupied Jerusalem. The attack resulted in the killing of an Israeli settler and the injury of 2 others. The Israeli forces are still detaining the child’s corpse. It should be noted that the Israeli forces raided and searched a house belonging to the family of the abovementioned child on 13 August 2018, and handed the family a written notice of the demolition decision after taking the house measurements. At approximately 16:00 on Friday 17 August 2018, thousands of Palestinian civilians swarmed to the Return encampments established by the Supreme National Authority for the Great March of Return and Breaking Siege, east of al-Shawkah village, east of Rafah in the southern Gaza Strip. A number of young men approached the border fence between the Gaza Strip and Israel, flew kites, set fire to tires and threw stones at Israeli soldiers stationed behind sand barriers along the border fence. The soldiers fired live bullets and tear gas canisters. The clashes continued until approximately 19:00 on the same day. As a result, Sa’adi Akram Ahmed Abu Mo’amer (27) was killed after being hit with a live bullet to the head at approximately 18:30. Sa’adi died as soon as he arrived at Gaza European Hospital in Khan Younis at approximately 19:00. Moreover, 25 civilians, including 8 children and 2 women, were hit with live bullets and its shrapnel. The wounded civilians were taken to the medical points at the Return encampment, east of Rafah. They then were transferred to Abu Yusuf al-Najjar Hospital in Rafah and Gaza European Hospital in Khan Younis. Doctors classified 2 civilians’ injuries as serious. Around the same time, hundreds of civilians swarmed to the Return encampments established by the Supreme National Authority for the Great March of Return and Breaking Siege, 400 meters away from the border fence between the Gaza Strip and Israel, east of al-Buraij in the central Gaza Strip. Dozens of them approached the border fence, set fire to tires and threw stones at Israeli soldiers stationed behind sand barriers along the border fence. The Israeli forces fired live bullets and tear gas canisters at the participants. At approximately 17:00, the demonstrators moved into the vicinity of Um Hasaniyah Hill in and attempted to approach the barbed wire on the hill. However, the Israeli soldiers fired opened fire at them during their attempt to approach the hill. The clashes continued until approximately 20:30 on the same day. As a result, Karim Ahmed ‘Ali Abu Fatayer (28) from Deir al-Balah. Ahmed was hit with a live bullet to the head at approximately 17:50 while he was among the demonstrators around 300 meters away from the border fence, adjacent to Um Hasaniyah Hill, east of al-Buraij refugee camp. Ahmed’s death was announced after half an hour of his arrival at al-Aqsa Hospital. Moreover, 20 civilians, including 6 children, were hit with live bullets and its shrapnel. The wounded civilians were transferred to al-Aqsa Hospital in Deir al-Balah. Doctors classified their injuries between minor and moderate. Around the same time, hundreds of civilians swarmed to the Return encampments established by the Supreme National Authority for the Great March of Return and Breaking Siege, east of Malakah intersection, east of al-Zaytoun neighborhood, east of Gaza City in the 21st consecutive Friday titled “Revolutionaries for Jerusalem and al-Aqsa Mosque.” The activities included raising flags, chanting national slogans, setting fire to tires and flying kites. Though the demonstrations were fully peaceful, Israeli forces stationed behind the border fence between the Gaza Strip and Israel deliberately and randomly fired live and rubber bullets and tear gas canisters at them. As a result, 46 civilians, including 10 children, were wounded. Thirty one of them were hit with live bullets and its shrapnel, 15 were hit with tear gas canisters. Jamal Ibrahim Mohammed al-Sayed (30), a volunteer paramedic at PRCS from al-Buraij refugee camp, was hit with a live bullet shrapnel to the right knee. Mahmoud Yusri ‘Ayesh al-Masri (20), a volunteer paramedic at PRCS from Beit Hanoun, was hit with a tear gas canister to the right hand. Around the same time, hundreds of civilians swarmed to the Return encampment, east of Khuza’ah village, east of Khan Younis, to participate in the demonstrations established by the Supreme National Authority for the Great March of Return and Breaking Siege. They chanted national slogans and flew kites and balloons as dozens of them, including women and children, approached the border fence between the Gaza Strip and Israel and set fire. A number of them attempted to throw stones at Israeli forces. The Israeli snipers stationed behind sand barriers along the border fence deliberately and selectively targeted the participants, who were about 300 meters away from the border fence. Tear gas canisters were heavily fired by the Israeli soldiers stationed in military vehicles and by a drone hovering over the sky of the area. The clashes continued until approximately 20:00 on the same day. As a result, 18 civilians, including 2 children and 2 women, were wounded. Fourteen of them were hit with live bullets and 4 others were hit with tear gas canisters. At approximately 16:00 on Friday, 24 August 2018, hundreds of civilians swarmed to the Return encampments established by the Supreme National Authority for the Great March of Return and Breaking Siege, east of Malakah intersection, east of al-Zaytoun neighborhood, east of Gaza City in the 22nd consecutive Friday titled “Fulfillment to Efforts and Sacrifices of Medical Personnel.” The activities included raising flags, chanting national slogans, setting fire to tires and flying kites. Though the demonstrations were fully peaceful, Israeli forces stationed behind the border fence between the Gaza Strip and Israel deliberately and randomly fired live and rubber bullets and tear gas canisters at them. As a result, 29 civilians were wounded. Fifteen of them were hit with liv bullets and its shrapnel and 14 were hit with tear gas canisters. Around the same time, hundreds of civilians swarmed to the Return encampment, east of Khuza’ah village, east of Khan Younis, to participate in the demonstrations established by the Supreme National Authority for the Great March of Return and Breaking Siege. They chanted national slogans and flew kites and balloons as dozens of them, including women and children, approached the border fence between the Gaza Strip and Israel and set fire. A number of them attempted to throw stones at Israeli forces. The Israeli snipers stationed behind sand barriers along the border fence deliberately and selectively targeted the participants, who were about 300 meters away from the border fence. Tear gas canisters were heavily fired by the Israeli soldiers stationed in military vehicles. The clashes continued until approximately 19:30 on the same day. As a result, 13 civilians were wounded. Six of them were hit with live bullets and 7 were hit with tear gas canisters. Doctors classified a civilian’s injury as serious. Around the same time, hundreds of civilians swarmed to the Return encampments established by the Supreme National Authority for the Great March of Return and Breaking Siege, 400 meters away from the border fence between the Gaza Strip and Israel, east of al-Buraij in the central Gaza Strip. Dozens of them approached the border fence, set fire to tires and threw stones at Israeli soldiers stationed behind sand barriers along the border fence. The Israeli forces fired live bullets and tear gas canisters at the participants. The clashes continued until approximately 20:00 on the same day. As a result, 10 civilians, including 2 children, were wounded. The wounded civilians were transferred via PRCS ambulances to al-Aqsa hospital in Deir al-Balah. Doctors classified one of the children’s injury as serious and he was admitted to the operation room as soon as he arrived at the hospital. The other civilians’ injuries were classified between minor and moderate. Ahmed Abdul Bari al-‘Abed Abu Foul (35), a paramedic at PRCS was hit with a tear gas canister at the left shoulder. Abdul Rahim Mohammed Shehdah al-Madhoun (20), a paramedic at the Ministry of Health was hit with a tear gas canister to the left shoulder. Abdul Rahim Ashraf Abdul Rahim Abu Mahadi (20), a paramedic at the Ministry of Health was hit with a tear gas canister to the abdomen. At approximately 17:00 on the same Friday, thousands of Palestinian civilians swarmed at the Return encampment established by the Supreme National Authority for the Great March of Return, east of al-Shawkah village, east of Rafah in the southern Gaza Strip. A number of young men approached the border fence between the Gaza Strip and Israel, flew kites, set fire to tires and threw stones at Israeli soldiers stationed behind the border fence. The Israeli soldiers fired live bullet and tear gas canisters at them. The clashes continued until approximately 19:00 on the same day. As a result, 7 civilians, including 3 children, were hit with live bullets and its shrapnel. The wounded civilians were taken to the medical point in the Return encampment and then transferred to Abu Yusuf al-Najjar Hospital in Rafah. At approximately 17:00 on Saturday, 18 August 2018, a group of Palestinian civilians moved from the center of Kufor Qaddoum village, northeast of Qalqiliyah, to the eastern entrance to the village, which has been closed for 15 years in favor of the entrance to “Kedumim” settlement. The protestors chanted national slogans demanding to end the occupation and condemning the Israeli forces’ crimes against Palestinian protestors along the eastern border of the Gaza Strip within “The Great March of Return and Breaking the Siege” activities. The protestors threw stones at Israeli soldiers stationed behind sand barriers. The soldiers fired rubber bullets, sound bombs and tear gas canisters at them. As a result, Norwegian activist, Christine Folls (35), was hit with a rubber bullet to the abdomen. At approximately 13:40 after performing Friday prayer on 24 August 2018, a group of Palestinian civilians moved from the center of Kufor Qaddoum village, northeast of Qalqiliyah, to the eastern entrance to the village, which has been closed for 15 years in favor of the entrance to “Kedumim” The protestors chanted national slogans demanding to end the occupation and condemning the Israeli forces’ crimes against Palestinian protestors along the eastern border of the Gaza Strip within “The Great March of Return and Breaking the Siege” activities. The protestors threw stones at Israeli soldiers stationed behind sand barriers. The soldiers fired rubber bullets, sound bombs and tear gas canisters at them. As a result, 8 civilians, including the Norwegian activist, Christine Folls (35), were wounded, who was hit with a rubber bullet to the right foot, and Mo’men Murad Eshtiwi (8), who was hit with a rubber bullet to the back. It should be noted that the Norwegian activist was hit with a rubber bullet to the abdomen on 18 August 2018, during her participation in a similar demonstration at the abovementioned entrance. On Monday morning, 27 August 2018, a group of settlers, under the Israeli forces protection, moved into al-Shiekh Jarrah neighborhood, north of occupied East Jerusalem and seized a land belonging to Abdel Raziq al-Shiekh. Hashem Bader, Member of al-Shiekh Jarrah Families Committee, said that Israeli forces accompanied with representatives of the so-called Absentee Property Custodian Department moved into al-Shiekh Jarrah neighborhood and seized a 50-square-meter land belonging to Abdel Raziq al-Shiekh, adjacent to his house and next to “Kabanyet Oum Haroun” area. He added that Israeli forces imposed a security cordon on the area and prevented Palestinian civilians from entering it. The Israeli forces then secured Israeli settlers and the bulldozer that levelled the land and uprooted the trees. It should be noted that the plot of land was seized without any judicial procedure, in which the “General Custodian “claims his ownership of the land. Bader added that ‘Abdel Raziq al-Shiekh owned the land for more than 50 years and the Israeli settlers seized it without a court decision. Lawyer Majed Ghanayem was able to issue an order to stop the seizing temporarily. It should be noted that the Israeli authorities target al-Shiekh Jarrah neighborhood through implementing settlement plans in cooperation with settlement associations to seize Palestinian lands and facilities. In the previous years, a number of houses and facilities were seized and transferred to settlement outposts. At approximately 9:00 on Wednesday, 29 August 2018, the Israeli Municipality vehicles demolished a commercial shop in ‘Ain al-Louza neighborhood in Silwan village, south of occupied East Jerusalem’s Old City. Samarin Family said that the Israeli police and Israeli Special forces raided a printing house belonging to ‘Izz al-Deen Samrin in ‘Ain al-Louza and then demolished it under the pretext of non-licensing. The family added that the 70-square-meter printing house was rented from ‘Omar ‘Awni Siyam. Samarin Family said that the Israeli Municipality staffs came 2 months ago and took photos of the printing house and then handed the family a demolition notice. Samarin Family confirmed that Siyam Family stopped the demolition decision by their lawyer, but the Israeli Municipality came and demolished the printing house. Omar ‘Awni Siyam, the owner of commercial shop, said that the printing house was built 15 years ago after getting an approval from the Israeli Municipality and building a street in the neighborhood. Omar clarified that the Israeli Municipality’s claims that the printing house has no licenses are wrong. He said: “today, I tried to submit and show a paper, which includes the approval from the Israeli Municipality to build the printing house, but the Israeli forces and municipality refused and insisted to demolish it. He stated that the Israeli Municipality issued the demolition decision on 08 August 2018. He then headed along with the lawyer to the municipality to challenge the decision, clarifying that the printing house is licensed. It should be noted that the lawyer and the printing house owner don’t receive any response from the municipality until now. Siyam added that the 70-square-meter printing house was rented by Samarin family. While demolishing the printing house, the Israeli forces barbarically attacked civilians in ‘Ain al-Louza neighborhood, beat them, heavily fired sound bombs and rubber-coated metal bullets at them, and pepper-sprayed at them. The neighborhood’s residents stated that the Israeli forces intentionally beat all women, children, elderlies, youngsters, and paramedics. Furthermore, the Israeli forces fired rubber-coated metal bullets and tear gas canisters at medical center and then attempted to raid it. As a result, 8 civilians sustained various wounds. Haitham Yaghmour, Director of the Medical Center in ‘Ain al-Louza village, said that 8 civilians arrived at the center after beating them by the Israeli forces; one of them was hit with a rubber-coated metal bullet to the hand while other civilians were hit with batons to head and neck. Moreover, many civilians suffered tear gas inhalation. Haitham Yaghmour added that the Israeli forces fired tear gas canisters at the medical center while a number of pregnant women were waiting the Obstetrics and Gynecology doctor. As a result, 3 of those women suffered tear gas inhalation and were then taken to al-Makassed Hospital. The Palestinian Red Crescent Society (PRCS) stated that its staff took the pregnant woman, who suffered tear gas inhalation during the demolition incidents occurred in Silwan village, to the hospital. Amjad Abu ‘Asab, Head of the Prisoners’ Families Committee in Silwan village, said that the Israeli police severely beat 4 Palestinian civilians and then arrested them during the demolition occurred in Silwan village. Among those arrested persons were Izz al-Deen Samrin (30), the printing house owner, Tarek al-Rowaidi (23) and Ahmed Samarin (46). On Sunday morning, 19 August 2018, a group of Israeli settlers, from the so-called “Price Tag” groups, wrote racist slogans and damaged vehicles in a Palestinian neighborhood in al-‘Issawiya village, northeast of occupied East Jerusalem. Mohammed Abu Humus, Member of the Follow-up Committee in al-‘Issawiyia village, said that a group of Israeli settlers wrote bad slogans against Jerusalemites on the walls of Palestinians’ houses in Habayel al-‘Arab neighborhood. He added that the settlers punctured tires of 15 vehicles parked in the neighborhood, pointing out that the Israeli police came and opened an investigation. He also said that the area, where the incident took place, is full of Israeli surveillance cameras which means that the Israeli police can identify those settlers and immediately arrest them after watching the cameras records. The “Price Tag” gangs are groups of settlers, who carry out attacks against Palestinians, their property, their sanctities and places of Islamic and Christian worship. These gangs were officially appeared in 2008 and called themselves “Tag Mahir”, which means “Price Tag” in Arabic. At approximately 09:00 on Monday, 27 August 2018, Israeli forces baked by military vehicles and accompanied with a vehicle of the Israeli Civil Administration moved into Kherbit Zanotah, west of al-Dahiriyia village, south of Hebron. The Israeli Civil Administration staff took photos of a school built with bricks and fixed a notice on it to stop construction works under the pretext of non-licensing in area classified as Area C, to the 1993 Oslo Accords. It should be noted that on 09 April 2018, the Israeli forces demolished the school, which was comprised of tents and a concrete floor, and confiscated all students ‘desks. As a result, around 39 students were deprived of continuing their study. The students’ families were also forced to register their sons in nearby villages, which are 2 kilometers away from their village. Around 150 persons belong to 27 families are living in Kherbit Zanotah and breeding livestock. In 2007, the Israeli Civil Administration issued demolition orders against many houses under the pretext of non-licensing. It should be noted that Kherbit Zanotah has no structural map to build on it or to obtain construction licenses. The Israeli Civil Administration claimed that the above-mentioned village is too mush small and does not need a structural map, clarifying that the distance between the village and other nearby villages is too far. 1- ‘Adnan Ahmed Moustafa Qabha: a 250-square-meter barrack was used for breeding livestock and poultry. 2- Yihya Ratib Mohammed Qabha: a 300-sqaure-meter barrack was used as poultry farm. 3- Mohammed ‘Ali Hassan: a 500-square-meter barrack for breeding livestock. 4- Jawwad Abed Hamdan Qabha: a 350-square-meter barrack used as a poultry slaughterhouse and a farm. This barrack was rented by ‘Anan al-Shaf’I, from Nablus, to work in it. On Wednesday morning, the Israeli Civil Administration handed notices for a number of lands’ owners located in the vicinity of al-faridis square, east of Bethlehem, adjacent to the bypass street that connects settlements established on civilians’ lands, east of Bethlehem, in ” Har Homa” settlement, which became one of Jerusalem’s suburbs. A number of the land’s owners stated that Israeli soldiers threw the notices along with a map shows the lands location. The Israeli forces clarified in the notices that they intent to seize those lands, which are estimated at dozens of dunums, for security reasons. The abovementioned lands belong to many civilians. The notices included information stating that the Israeli forces intent to uproot hundreds fruitful trees planted on the lands. The notices include: “the trees should be removed from the area to be visible and to secure the vehicles’ movement, whether military or private vehicles”. The lands’ owners said that this decision is serious and aims at seizing the lands under security reasons and annexing them into nearby settlement outposts. The owners clarified that this is the Israeli authorities’ approach to seize lands, confirming that the decision will isolate more lands and prevent residents from living or planting there. At approximately 09:00, on Tuesday, 20 August 2018, a group of Israeli settlers, from “Mitzpe Yair” settlement, moved into an under-construction room in Khirbat Kawakis, near the Street (317), southeast area of Yatta, south of Hebron. The settlers attempted to steal construction materials from the room. Meanwhile, a group of civilians rushed and tried to confront the settlers. After that, Israeli police and forces arrived at the area, disperse civilians and then confiscated the construction materials from the room. Following that, the Israeli forces brought a bulldozer and levelled a residential tent belonging to Yousif Ayoub abu Aram, under the pretext of non-licensing. At approximately 23:20, on Thursday, 16 August 2018, following the killing of an Israeli settler in a traffic accident near “Havat Gilead” settlement, southwest of Nablus, a group of settlers, from “Yitzhar” settlement, attacked al-Mahajer area, between ‘Urif and ‘Aseera al-Qeblyia villages, east of ‘Urif village, south of Nablus. The settlers set fire at a digger belonging to ‘Ali ‘Eissa Makhlouf, from ‘Aseera al-Qeblyia village, after pouring a flammable material at the digger. At approximately 07:00, on Friday, 17 August 2018, Yousif Sliman Hassan headed to his work on a plot of land belonging to Na’el Ahmed Mohammed ‘Awaysa, from al-Laban al-Sharqiyah village, south of Nablus. When Yousif arrived at the land, which is located in Wad ‘Ali area, south of al-Laban al-Sharqiyah village, adjacent to the entrance of “Eli” settlement, he was surprised that around 85 trees planted in an area of 360 square meters were damaged. The trees planted 5 – 7 years ago. At approximately 23:30, on Friday , a group of settlers, from “Meria” settlement, which is built on the lands of Ras Karkar village, northwest of Ramallah, moved into al-Mugtama mount, north of Ras Karkar village. The settlers cut and damaged about 70 olive trees belonging to Khaled Samhan (66). They also wrote Hebrew racist slogans on a surface of a water well built in the same place. On Saturday morning, 18 August 2018, a group of settlers, from “Mavodotan” settlement, which is built west of ‘Araba village, southwest of Jenin, attacked a land belonging to Nazmi Mohammed Dehaidy and his brothers Mahmoud and Subhi ; and a land belonging to their neighbor Mustafa ‘Obaid and his brothers in al-Quraynat area near “Mavodotan” settlement. The settlers cut 350 olive trees using automatic saws. The trees planted 15 -to 25 years ago. At approximately 03:00, on Tuesday, 21 August 2018, which was the first day of ‘Eid al-Adha, a group of settlers, from “Yitzahar” settlement, south of Nablus, attacked a house belonging to Nihad Najeh Abdelfattah Sabbah from ‘Urif village. The house is located between ‘Urif and ‘Ein’abous villages. The settlers punctured tires of Nihad’s car and drew Magen David Adom (MDA) and a smile face on the back of his car. After that, they withdrew towards ‘Urif village. At approximately 15:00, on Wednesday, 22 August 2018, a group of settlers, from “Yitzahar” settlement, south of Nablus, attacked the south part of Madama village under the Israeli forces’ protection. The settlers threw stones at civilians’ houses , so a number of village residents gathered and threw stones on the settlers and the Israeli soldiers. ‘Emad Ibrahim Sa’ada Ziyada (46) moved forward to talk to the soldiers but he was immediately hit with 4 rubber coated-metal bullets at his left hand, chest and his waist. ‘Emad was transferred to Rafidia Governmental Hospital in Nablus for treatment. Ziyad Abdel’aziz Shehada. The Israeli settlers smashed his car’s windows and punctured its front and back tires. It should be noted that, on 13 July 2018, settlers set fire to 2 cars belonging to Ziyad. 2-Mahmoud Mahfouz Jamil Shehada. The Israeli settlers fully smashed his car’s windows and punctured 3 of its tires. 3-Baker Nabil Mustafa Shehada. The Israeli settlers punctured its 4 tires and fully smashed its windows. At approximately 06:30, on Friday, 24 August 2018, Mohammed Ghazi Hassan Suliman headed to his work on a land belonging to his uncle, Ahmed Hassan Mahmoud Sulieman, both of them from al-Sawya village, south of Nablus. The land is located in Wad al-Sawya village, near “Rahlim” settlement, south of Nablus. When Mohammed reached the land, he was surprised that 30 olive trees were cut with automatic saws. At approximately 17:30 on Friday, a group of Israeli settlers gathered at the entrance to “Homesh” settlement, which was evicted, on Nablus-Jenin Road, northwest of Nablus. The settlers threw stones at vehicles belonging to Palestinian civilians and passing through the road mentioned above and carried out riots on the street. At approximately 21:00, on Monday, 27 August 2018, a group of settlers, from “Yitzahar” settlement, south of Nablus, attacked and threw stones at a house belonging to Nihad Najeh Abdel Fattah Sabbah, at the entrance to ‘Einabous, south of Nablus. As a result, the house’s balcony was damaged and its windows were smashed. It should be noted that Sabbah family, which is consisting of the parents and 2 children, were out of the house when the attack happened. On Monday evening, a group of settlers, from “Shilo” settlement, which was established on a part of Senjil village’s lands, north of Ramallah, attacked the outskirts of the village, near the main street of Ramallah-Nablus. The settlers set fire to tires of 15 Palestinian vehicles and wrote racist slogans in Hebrew on the houses’ walls, calling for revenge and killing Palestinian civilians.